Golden beaches, tropical weather and friendly people make for an ideal vacation. Thailand holidays also promise a fascinating culture and awesome architecture and artwork. This corner of Asia is a popular destination, particularly with young backpackers and couples looking for an exotic location. The country is very cheap from a western perspective. There is a wide range of accommodation, including backpacker hostels, guesthouses, tourist hotels and luxury hotels. Swimming pools, room service and color television is standard in tourist hotels. The local currency is the baht and there are ATMs in cities and large towns. Visitors will need cash or travelers checks for remote islands etc. Shopping is one of the pleasures of Thailand holidays, especially when bargain hunting for clothes, silk and handicrafts in the markets. Food is tasty and tends to be spicy and has its own distinctive Asian flavors. Rice and rice noodles are staples and fish is extremely popular. Thai food is often flavored with chilies, lime juice, lemon grass and fish sauce. There is an Indian and Chinese influence and curries and stir fries are much in evidence. For the less adventurous, well known fast food chains have branches here. Street food stalls are a good way of trying out different snacks and there are several Internet cafes in the towns. Vegetarians on Thailand holidays manage very well here. The capital city of Bangkok is an exciting blend of the modern and the sacred. Nightclubs, entertainment and restaurants give the city its vibrancy whilst the spiritual side can be explored in various temples. The most popular temples are The Temple of Dawn, The Grand Palace and Wat Pho, which is famous for its huge statue of Buddha. Beach resorts entice many visitors, particularly at Pattaya. It caters to the tourists with countless hotels, shopping outlets and nightlife. The resort is famous for its numerous Go Go Bars and Beer Bars. Thailand holidays can also appeal to golfers and this resort specializes in golf facilities with over twenty courses. It's also a favorite haunt for water sports enthusiasts. Elephant trekking can be organized from here and visitors can swim with dolphins at Oasis Seaworld. There is a popular, tropical aquarium at Underwater World Pattaya. For great views, there is Buddha Hill, also worth a trip for the Buddha statue. 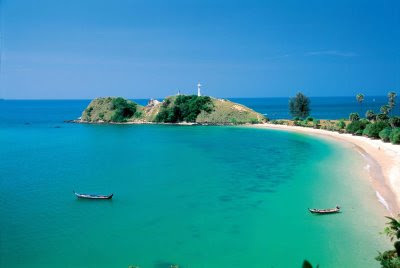 The largest island in Thailand is Phuket and the largest resort on the island is Patong Beach, a center for water sports, entertainment and restaurants. Phuket Town is a bustling town and a great place to shop. There are market stalls, department stores, shopping malls and outlets for antiques, arts and crafts. As usual on Thailand holidays, there are some lovely temples to browse round.